Join me on this exciting new photography workshop destination for 2019 for 9 days (8 nights) in beautiful Scotland. The Scotland Highlands; a majestic land of soaring mountains, dazzling emerald lochs and deep glens is one of the most beautiful landscapes in the world. Mysterious myths and legends add to the landscape's natural beauty and it is a 'must visit' location for every landscape photographer. Meeting at Glasgow airport on 1st November, we will drive up along Loch Lomond, the largest expanse of water in Scotland. Experience the beauty of the loch as we travel along its shoreline stopping at the Falls of Falloch before heading on towards the Bridge of Orchy. For 4 nights we will stay at The Bridge of Orchy hotel, in the small village situated at the head of Glen Orchy. During our stay here we will be able to easily travel to several of the workshop locations nearby. 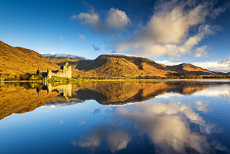 We will drive along Rannoch Moor, take in the breathtaking light and amazing views across Lochan na h-Achlaise to Black Mount; venture into the deep gorge at the Birks of Aberfeldy; a place of immense natural power and beauty and, ultimately, arrive at Scotland's most famous and scenic glen, Glen Coe. During this photography workshop, we will also visit the evocative ruin of Kilchurn Castle on the banks of Loch Awe, which is a superb setting for capturing an early Scottish mist (mist to be provided at nature's discretion!). For the next 3 nights we will travel to stay at The Ballachulish Hotel on the shores of Loch Linnhe with magnificent views over the hills of Glen Coe. Being close to the other side of Glen Coe we will then explore locations that Scotland has to offer, such as Glen Etive with its range of rapids, waterfalls and pools. 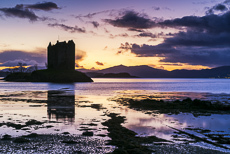 Stalker Castle, picturesquely set on a small tidal islet at the mouth of Loch Laich, is a superb setting for spectacular sunsets and if time permits we will head over to the Glenfinnan Viaduct as seen in Harry Potter. For our last night in Scotland, we will travel and stay in Glasgow for blue hour along the river. Flights depart on the morning of 9th November. With a maximum of 3 people, book early to avoid disappointment. This will give you quality time for individual tuition whatever your photographic level. There will be moderate hiking involved so a good level of fitness and sturdy footwear are essential for this Scottish photography workshop.